The resolution also calls on Khartoum and the Sudan People’s Liberation Movement-North, or SPLM-N, to resume negotiations based on the June 2011 framework agreement and under the facilitation of the AUHIP and the Chair of IGAG. Sudanese President Bashir previously repudiated the framework agreement shortly after its conclusion. Moreover, the resolution “strongly urges” Khartoum and the SPLM-N to accept the so-called Tripartite Proposal concerning access of humanitarian aid to the Sudanese states of South Kordofan and Blue Nile. To this end, last week the SPLM-N Secretary General, Yasir Arman, confirmed SPLM-N’s commitment to allow international humanitarian aid into the two states. In a strong statement of its resolve to see the resolution enforced, the Security Council declared that failure on the part of any party to implement any or all aspects of the resolution could result in the imposition of U.N. sanctions under Article 41 of the U.N. Charter. Immediately following the vote, H.E. Deng Alor Kuol, South Sudan’s Minister of Cabinet Affairs, conveyed his government’s “solemn commitment to comply with its [the resolution’s] mandated provisions.” This follows a letter sent on April 27 by the government of South Sudan to the A.U., in which Juba conveyed its commitment to immediately cease hostilities with Sudan and to resume negotiations with Khartoum Notably, the letter fell short of an unconditional acceptance of the A.U.’s April 24 decision. Also on May 2, the A.U. announced Khartoum’s acceptance of the A.U.’s decision “in principle,” as well as its commitment to cooperate with the AUHIP in reaching agreement on all outstanding issues, particularly the security issues. Further, a separate statement issued by the government of Sudan stated: “The government of Sudan confirms her own strategic calls to have peace between the two states and it hopes the government of South Sudan gives a positive reaction to the African and UN Security Council resolutions." The Security Council resolution, with its unanimous support from within the Council, coupled with the threat of sanctions, is, no doubt, a significant diplomatic demonstration of the international community’s commitment to peace and stability within and between the two Sudans. However, while the resolution seems patently well-intentioned and aptly focused, the possibility for its complete implementation remains questionable. Notably, neither Khartoum nor Juba fully accepted last week’s A.U. decision. One provision that likely raised concerns on both sides is one that empowers the AUHIP to present final and binding solutions to all outstanding post-secession issues, should the two parties fail to reach an agreement within three months. While designed to pressure the two sides to reach timely agreements, this aspect of the A.U. decision may likely sour the already tenuous dynamic between the AUHIP and the two parties, particularly Juba, which already views the panel as northern-leaning. As negotiations again resume, the international community should remain seized of the process’ status and intervene diplomatically and technically to ensure it proceeds constructively towards the ultimate goal of the parties themselves reaching agreement on all outstanding issues, as opposed to the AUHIP deciding for them. The international community must also continue to apply appropriate diplomatic pressures on Khartoum to help ensure that those aspects of the Security Council resolution concerning the delivery of humanitarian aid and the resumption of talks with the SPLM-N are implemented. Vigilance in this regard is of particular importance, given that these aspects of the resolution do not include an implementation time table similar to those aspects concerning north-south issues. The specter of sanctions, alone, has rarely prompted Khartoum to act in the past. Indeed, the regime continues to commit gross human rights abuses against Sudanese citizens and bomb sovereign South Sudanese territory, despite existing U.N. and U.S. sanctions. The international community must therefore remain actively seized of Khartoum’s actions vis-à-vis the Tripartite Proposal and negotiations with the SPLM-N, and be prepared to immediately impose and implement threatened sanctions should implementation not materialize. Furthermore, the U.N. Security Council should consider passing an additional resolution to lay out clear implementation benchmarks for both the government of Sudan and SPLM-N with regards to humanitarian aid access, a negotiated ceasefire, and verifiable progress towards a holistic political agreement, the negotiation of which should include representatives from all of Sudan’s marginalized communities. Given Khartoum’s historic propensity to disavow agreements signed, largely through endless delays in implementation, the international community’s commitment to establishing verifiable implementation benchmarks for Khartoum’s adherence to the Security Council resolution—as well as any agreements concluded with the SPLM-N, other Sudanese opposition forces, or Juba moving forward—will be absolutely critical to consolidating peace, democracy, and stability within and between the two Sudans. 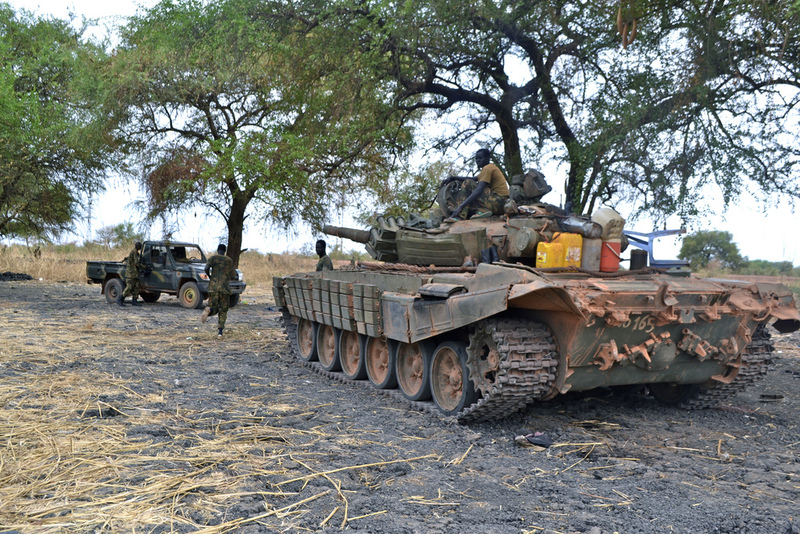 Photo: SPLA on the frontline in Unity State (Nenad Marinkovic/Enough Project).